Haskap Berries from our Garden!! Recently my friend John who is a fellow fruit enthusiast like myself and helps run the NASE with me, sent me an email with a link to a program entitled The Fruit Hunters. Documenting the history of fruit and the industrialization of the food chain, The Fruit Hunters takes us on a journey through history and around the globe. From the jungles of Borneo and Bali, to a banana breeder in Honduras, and the flat northern plains of Saskatchewan, people around the globe have made it their mission to preserve, propagate, and share exotic, rare, and often times threatened species of fruit. Whether it is the Wani white mango, the quest to breed a more genetically diverse and resilient banana, or introducing the sweetly tart haskap berry to the culinary world, humans love affair with fruit is older than written history. Since the days when we climbed down out of the trees, our symbiotic evolution with fruit has been many things – a culinary desire, a poetic muse, and a forbidden love. Fruit has adorned the artwork in the halls of kings, and been the foundation in ceremonies for tribal people. It is the favorite summertime snack of a smiling, messey 6 year old, and a common culinary ingredient in so much cooking from around the world. Fruit is a global desire – something we can never get enough of when it is in season, and something we long for in the cold, dark days of winter. Those of us who are a part of the modern homesteading movement are carrying on traditions that were a part of everyday life only two generations ago. We grow food, we preserve it, and we pass on all that accumulated genetic wealth and history to the next generation. But modern, industrial agriculture has done such a good job of separating people from the land and these homesteading traditions, that most people do not think twice about where their food comes from anymore. It only makes sense that apples, oranges, and bananas come from the grocery store, right? This has been made possible by creating a “Global Summertime” that is powered by massive inputs of energy dense fossil fuels. The global supply chain of fruit production, from the field to the shelf, has very little room for genetic diversity and unique traits amongst all that is grown. If you were a piece of fruit – a strawberry, an apple, a lime – and you were to be shipped halfway around the world in February, there are only a few things that the global fruit supply chain cares about. The first is ripening time. If you and all your brother and sister fruits do not ripen at the same time, whether that is on or off of the vine, shrub, or tree, you would never be considered for the circumnavigation of the globe. Second, if you are too difficult to harvest efficiently, sorry, maybe next time. And third, if you do not have thick skin and a body that cannot be roughed up a bit and look better for the wear over a journey of a few thousand miles, than that will not work either. Notice how flavor and aroma are not on that list. Neither is the fruit inspired passion and ecstasy that comes from a just picked raspberry, or the first bite of an intensely flavored Rubinette apple, or a tree ripened plum. Global fruit does not care about human passion and desire, and it definitely does not care about genetic diversity amongst the plants that we grow for our food. Every banana you find at the supermarket is the same Cavendish banana that is being grown worldwide on every banana plantation. Highly prone to disease, the fate of the global monoculture of the banana rests uneasily on a regiment of fungicides, insecticides, slave-like labor and a hope that a global pandemic like the one in the late 1960’s can be avoided today. 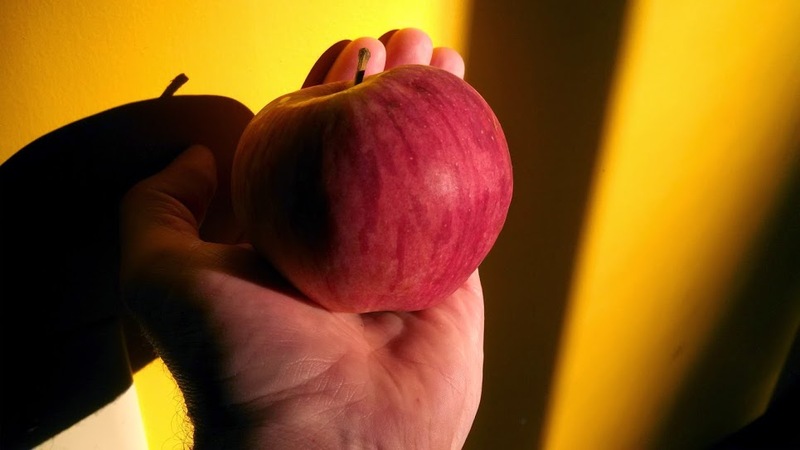 Another example of intolerance towards genetic diversity within the global food production system is the apple. Quite possibly the most well known fruit in North America, Europe, and other temperate regions throughout the world, the apple has a long history that began in the mountains of Kazakhstan and has spread the world over. Ranging in color from greens, reds, yellows, and infinite combinations of the three, and with flavors as diverse as banana, pineapple, cinnamon, anise, honey, sweet, tart, and acidic; apples have been a historic treasure trove of genetic variation and unique characteristics. Even their names are evidence to the genetic wealth contained in the species Malus Domesticus – Brown Snout, Etter’s Gold, Black Oxford, Redfree, Hudson’s Golden Gem, King of Tompkin’s County, Smoke House, Sweet Bough, and Chestnut Crab all come to mind. Apples have taken their names from their physical appearance, flavor, place of origin, and the person who found or bred that particular apple. They have become local legends and have had festivals dedicated in their honor, and until recently, almost every region of America (and elsewhere in the world) have had their hometown heros. Worldwide there are about 7,500 varieties of apples grown today. In America there are about 2,500 varieties that are grown throughout backyards and home orchards, and about 100 of those are commonly found in small, commercial operations. Out of all of those apples to choose from, only about 15 varieties of them are grown on an industrial scale to supply the world’s taste demand for this wonderful pomme fruit. Just like so many other varieties of plants that have been molested to fit the industrial model of agriculture, apples have been stripped of their unique identities. Apples were made famous because of their great cider making traits, or their superb storing ability using traditional methods. Some were used for drying or baking or making sauce, but all of them were valued for their own unique reasons. Now an apple just needs to be sweet, without that much real flavor, and have the stamina to withstand the rigors of travelling the globe. It is a truly sad story to witness the destruction of a vast gene pool like the apple to the hands of convenience. While industrial agriculture is stripping the world of genetic diversity, there is a movement of individuals and groups throughout the world who are fighting back to protect it. Backyard and hobby orchardists, nurserymen, and globe trotting scientist and fruit hunters are on the front lines trying to preserve, protect, and spread all of these threatened genetics. 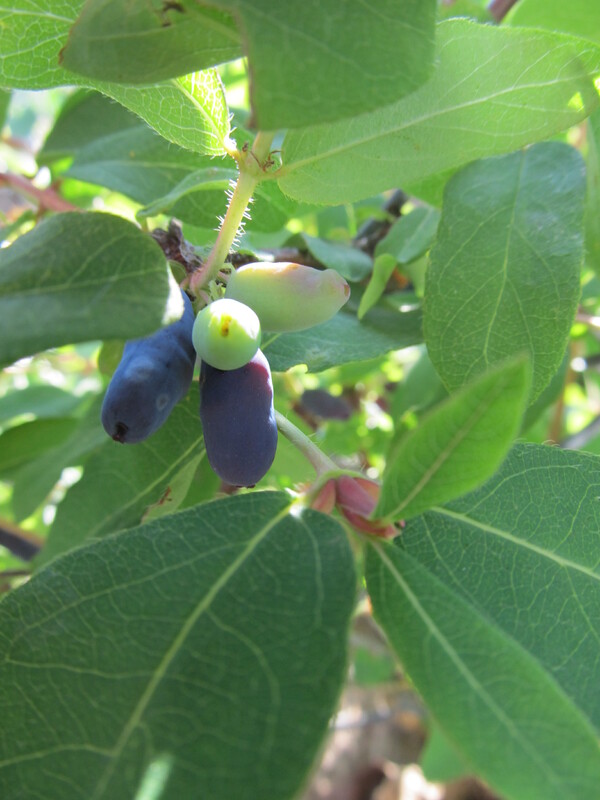 University arboretums, private collections, and orchards are all home to historic and endangered species of fruit. And there are also networks that have formed to help spread these genetics. In America there is the North American Scion Exchange (new website coming for the 2014 season!) and the Seed Savers Exchange, and in Europe there is Fruitiers.net. There are real life scion exchanges at farming conferences and get togethers , and online trading through gardening and sustainability forums. There is only so much that we as individuals can do, but the more of us who are actively participating in growing fruit, propagating genetics, and sharing what we have with the world can make a huge impact on preserving this rich history that belongs to all of humanity. The further we progress down the road of industrial civilization and the agriculture that makes it possible, the more genetic wealth we will lose forever. Every lost fruit whether it is an apple or a mango or a grape, not only represents millennia of evolutionary adaptation thrown to the wayside, but also a loss of human connection with the Earth. Genetic diversity within our food systems not only ensures security against disease, drought, famine, and other challenges we face as an agricultural society, it also roots us in traditions that are entwined with the food we grow and that in turn nourishes our bodies. Fruit is not just a food for the body, but also of the soul – the place where passion and poetry are born. Eating fruit that you helped to grow or forage from the wild can be a sensual experience, and is one of the things that make us human. Being inspired and moved by the sweetness of the flesh, the curvy shapes, and soft textures of fruit, we can connect with a part of our nature that has also been lost with the industrialization of food and the world. So while we all can’t travel the globe searching for endangered fruits, we can all help preserve fruit genetics by growing fruit locally. If you are a property owner try to plant as wide of a selection of fruit as possible. Plant old varieties and new ones, things that are proven winners for your climate, and try pushing gardening zones if your heart (and taste buds) desires something more exotic. Do not only grow these fruits, but help to spread their genes through scion exchanges and other plant swaps. Learn propagation techniques like grafting, rooting and air layering. If you do not have access to land to do this yourself, volunteer to help out those who do, or start planting your own Guerilla Forest Garden! On February 7th The North American Scion Exchange celebrated its first birthday. 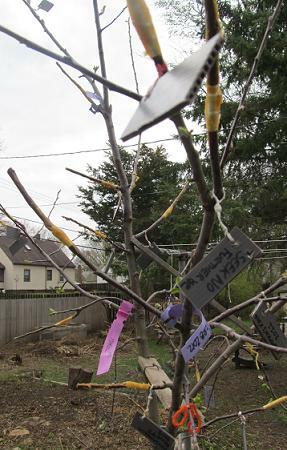 What started out as a simple Craigslist posting here in St. Paul, Minnesota to swap scion wood and other plant genetics, has now evolved into an international, bottom-up group of backyard and professional orchardists, cider makers, plant nursery proprietors, and an assortment of other fruits and nuts (pun intended!). The original idea came to me after exchanging some emails with my friend Steven. After hearing from him, and reading elsewhere about scion exchanges taking place out on the West coast, I figured it was time to try and organize something like that here. Piggy backing off of my wife’s Yahoo account, I set up the first incarnation of the exchange – The Upper Midwest Scion Exchange. A few people signed up, but like most things in their infancy they are slow to grow. Then someone with the internet moniker Wild Forager signed up and posted a great looking list of scion wood and other fruits they had available to share. Soon after that, we set up a trade and then talked on the phone. Wild Forager, or in the real world, “Little” John the broom maker, had a lot of great ideas for improving the Scion Exchange. We chatted for a good long while and decided upon a few changes that would be made to the exchange. First, Little John came aboard to help moderate the exchange, and second, he did a wonderful job of cleaning up, adding too, and organizing the forum. Without Little John’s help, The North American Scion Exchange would not be as awesome as it is today!! A BIG thanks to Little John!!! I also want to give a big shout out and thanks to all the members of the exchange!! 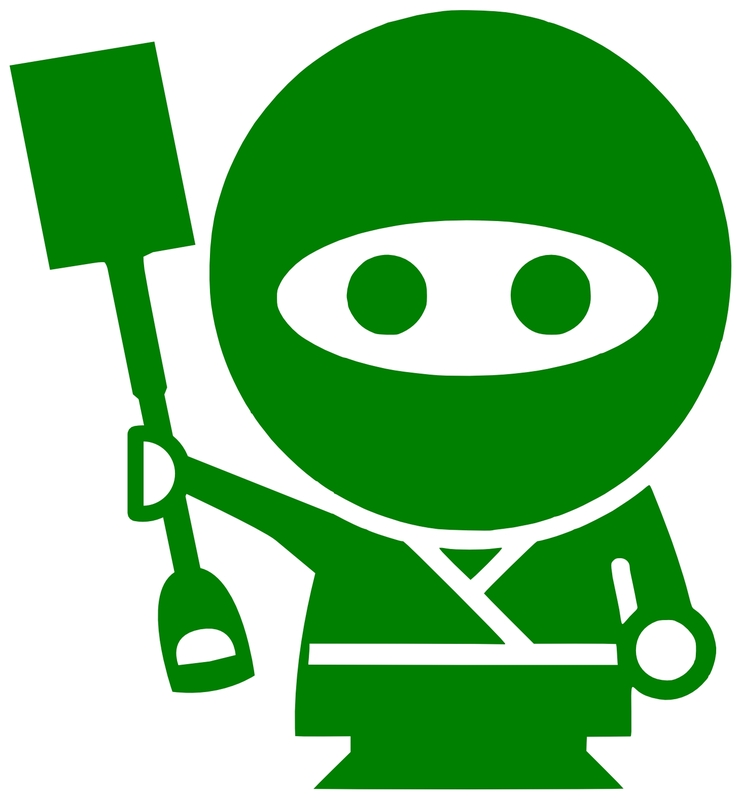 While it is cool to create something like the Exchange and share it with the world, it only works because of the real life people involved – so to all you 184 members and counting – keep on swappin’, graftin’, and plantin’!! Thank You! Moving on, but sticking to the topic of trading plants, this has been a very fruitful year for the exchange of plant genetics. Like always, my main obsession is with apples. I currently have 11 apple trees on our property, but these 11 trees have a combined 39 varieties grafted onto them. So far this season, and I am still awaiting a few more trades to arrive in the mail, I have already received 23 more varieties of apples. A majority of these will be grafted onto the !Frankentrees!, but a few are destined to grow as their own tree. 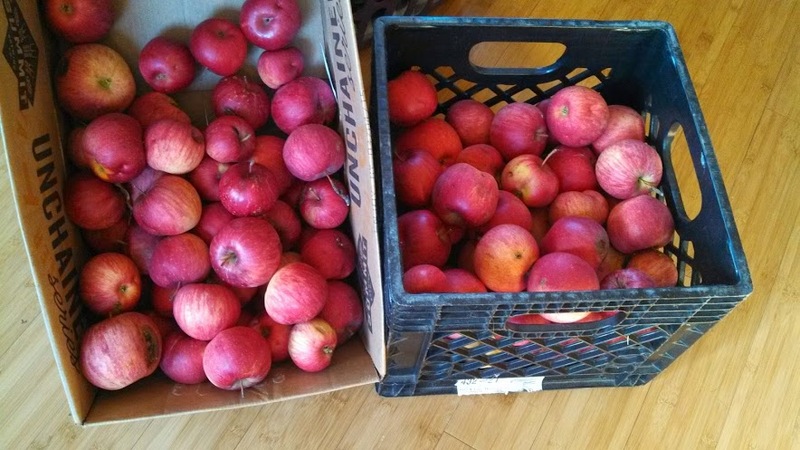 A few of the apple varieties that I am super excited about are Black Oxford, Sweet 16, Grimes Golden, and Wine Crisp, and at least a couple of these will find a home in our almost completed urban apple orchard!! Here are cuttings of Honeyberries, gooseberries, and currants – all growing roots! Apple scions are not the only genetics I have acquired thus far, I have also been collecting a few new plums – Elephant Heart, Pembina, and Mirabelle de Nancy have already arrived, and I am also hopefully getting Santa Rosa and a black plum. Continuing with Prunus genetics, I am also intrigued by, and will be experimenting with some apricots as well. Apache and Canadian White Blenheim just arrived and I also hope to get another named Chinese Sweet Pit. Here in Minnesota apricots may be pushing our gardening zone a little bit, but I think I have a nice microclimate located on the southern side of a dark privacy fence that should help protect them. Along with all the trees, a thanks needs to go out to my buddy KB! Once again he has sent me a nice selection of currants, gooseberries, and jostaberries (a cross between the other two), and they are all growing nicely so far. A handful of chestnuts, ready to be planted! Two more entries in the experiment category are chestnuts and tree collards. Chestnuts use to cover the American landscape until the early 1900s when the pathogenic fungus Cryphonectria parasitica, what is more commonly known as chestnut blight, wiped out virtually every mature chestnut tree on the continent. 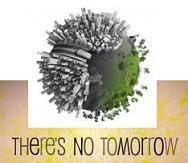 Since then, many tree scientists have invested much time and research into trying to find a solution to this problem. One solution has been the hybridization of the American chestnut, with those indigenous to China and Japan. This has yielded a chestnut tree that is fairly resistant to the chestnut blight, and may be the solution for repopulating the American continent with one of its original food forest giants! Cliff England (Thank you!!! 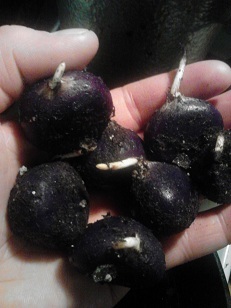 ), who is the owner of England’s Orchard and Nursery in Kentucky, was kind enough to to send me a 1 pound package of cold, stratified chestnuts (along with some other scion wood) that are ready to be planted (which I just did)! Check out Cliff’s website and support his business!! The tree collards came my way from my buddy Steven mentioned earlier. They are a perennial member of the Brassica family and look like what their name implies – collard greens growing on an upright tree. They are definitely not hardy enough to survive a Minnesota winter, so like the figs that I grow, they will spend their lives in containers and be brought inside for the winters. 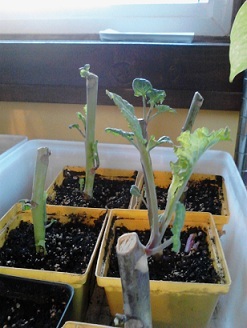 Doing research on rooting cuttings, I was under the impression that tree collards take a while to get established, so it is surprising that after only two weeks, I am already seeing a bunch of leaf growth. Only time will tell if they are successful, but I am pretty optimistic at this point that I will a have a nice collection of tree collards by this autumn. Thanks again Steven!! Here is our new room!! And for the last update of the winter (at least for now), is the completion of the addition to our house. I have made very small references to it before, but have never really talked much about it. 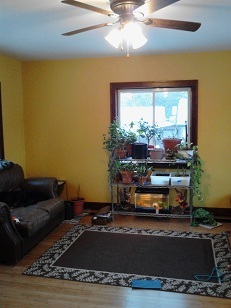 Over two years ago we applied for a home improvement loan through our county. It is a no interest, no payment loan that only needs to be paid back when we move or have the title changed, neither of which we plan on doing anytime soon! After much waiting, we were finally approved for the loan. Because we have been such responsible homeowners and have done so much improvement work ourselves to the property, we were able to convince the local bureaucrats that our family of four, living in a 900 square foot house needed more room to live comfortably. We ended up working with a great contractor and all the exterior work was finished by September. I have spent the last five months finishing the inside. Doing all the finishing trim, flooring, and base board work myself was quite the adventure and I have definitely learned a few new skill that will be helpful going into the future. Here are a few photos of the construction!! So there is what has been going on here for the last few months. Lots of skill building, plant sharing, and building up our plant biodiversity. We are not out of the cold months yet, but spring is right around the corner! Many seeds have already been started, plans for this years’ CSA are being laid, and I am ready to be outside on a regular basis again! Until next time … Peace & Cheers!! Rise Up Ye, Sons of !Frankentree! Son of !Frankentree! - He now has 22 varieties of apples grafted onto him!!! 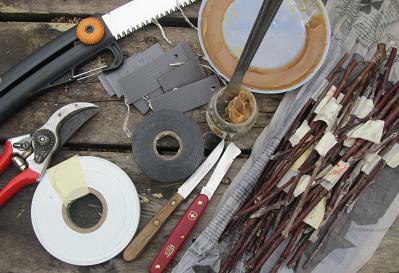 Here is everything you will need to start grafting - A pruning saw, pruners, grafting knives, budding tape and/or black rubberized splicing tape, Harvey's toilet wax (or wax made especially for grafting, labels, and scion wood! Now get grafting!! 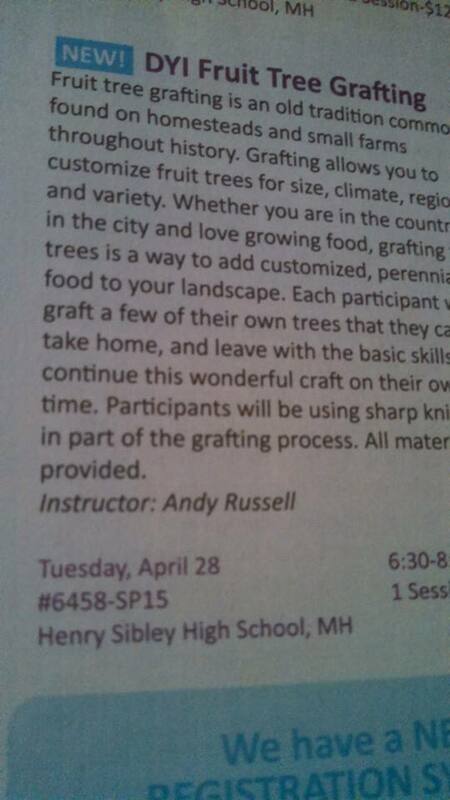 When I first learned the craft of grafting, I was taught using the whip and tongue method. 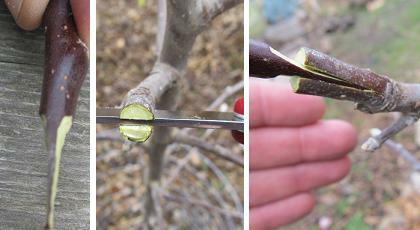 I did a bunch of grafts last year using this method, but because of a lack of practice, the wrong kind of knife, and a lack of other proper grafting supplies, only four of the approximately 20 grafts I did took off and were successful. It was disappointing, but a good lesson. Since starting down this path of a DIY lifestyle so long ago, the best way I learn a new skill is by failure. I am no longer scared to mess up and make mistakes. That doesn’t mean it is not frustrating, but by making mistakes it makes me focus harder and do the extra needed research and homework to be successful the next time around. This year I have switched to a new grafting technique called Cleft Grafting. It is a much easier graft to perform, and in most cases just as effective. Below is a series of photos to show how the cleft graft works. So far all the grafting I have done this season has been top working a tree. Top working is the process of turning over an existing tree to a new variety. Top working a tree has many benefits – if you are unhappy with your current variety, you can top work it with cleft grafts (and other methods) and switch over to a new, tastier or more productive variety. 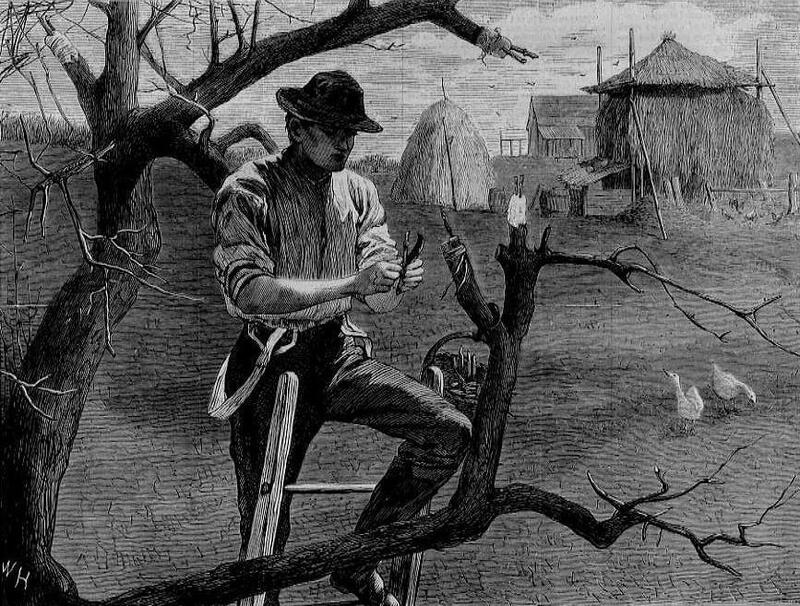 Another aspect of top working a tree is the time in which you will receive fruit from the newly grafted scion wood. The overall age of the tree, and specifically the rootstock, is what really influences fruit production. Son of !Frankentree! started life out as a Haralred, grafted onto to some kind of semi – dwarf rootstock. He was planted about four years ago, and he was at least two to three years old when he got planted. I have been getting Haralred apples off of him for about two years now. Last year when I started grafting onto him, the one apple that took and successfully grew is an apple named Gold Rush. That scion wood put on over a foot and a half of growth last year, and I will be getting one Gold Rush apple this year. So it is not the age of the grafted scion wood, as much as the overall age of the tree that impacts fruit production. 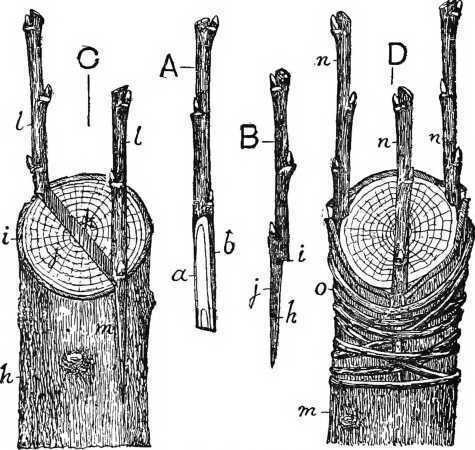 On the left is the cut scion wood, in the center is the cleft cut, and on the right is the finished cleft graft! Easy peasy! 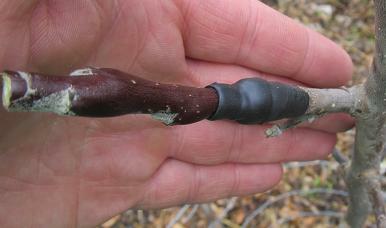 Here is the same graft, wrapped in splicing tape. You can also use the white budding tape, and remember to cover the graft in wax to keep it from drying out. 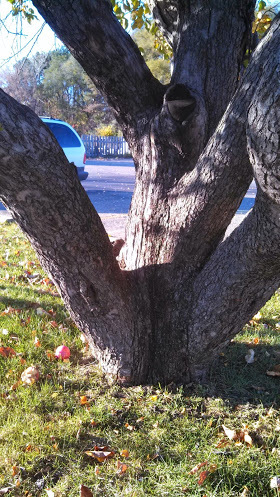 This is Crabby, a top worked crab apple tree. Originally he was a Prairie Fire Crab, but was recently turned into an Eden's and Wickson crab apple tree. One branch was left on as a "mother" branch to help feed the tree. This is Sir Cider Tree. 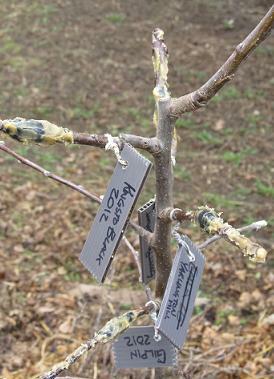 He now has six varieties of cider apples grafted onto him! 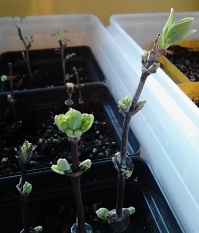 Sometime in the next week or two, I will be receiving my shipment of rootstock for more grafting. This time it will be not just apples, but also plums, peaches, and cherries. I am grafting up a few trees to give to friends, some will find homes here at the homestead, and a lot of them will be going to my in-laws as the start to our new cider orchard. We have mapped out a space and have room for about forty trees in the orchard – I will hopefully be bringing out at least twenty successfully grafted trees this fall to plant! Stay tuned for more grafting updates!! Cheers!